Nutrition Economics: Principles and Policy Applications establishes the core criteria for consideration as new policies and regulations are developed, including application-based principles that ensure practical, effective implementation of policy. From the economic contribution of nutrition on quality of life, to the costs of malnutrition on society from both an individual and governmental level, this book guides the reader through the factors that can determine the success or failure of a nutrition policy. 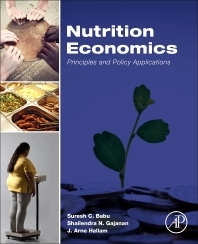 Written by an expert in policy development, and incorporating an encompassing view of the factors that impact nutrition from an economic standpoint (and their resulting effects), this book is unique in its focus on guiding other professionals and those in advanced stages of study to important considerations for correct policy modeling and evaluation. As creating policy without a comprehensive understanding of the relevant contributing factors that lead to failure is not an option, this book provides a timely reference. Chapter 1. Why Study the Economics of Nutrition? How can the Global Community Organize to Achieve the Global Nutrition Goals? What Have We Learned and How Do We Move Forward? How Do Macroeconomic Adjustment Policies Affect Nutritional Outcomes? What Do We Know: Policy Lessons? Designing and Implementing Social Protection: What Is the Best Approach? What Does the Current Literature Show? What Do We Know From Existing Literature? How Many Kids Are Fed in Schools? Do School Breakfast Programs Work? How Safe Are the Safety Nets in the United States? Can Higher Gas Prices Reduce Obesity? Policy Challenges: Will Fat-Taxes or Soda-Taxes Work? Policy: Should We Worry About Obesity? Does Public Opinion Sway Policy? Can Nutrition Labeling, Packaging, Advertising, Law, and Education Help? Suresh C Babu is a Senior Research Fellow and Head of Capacity Strengthening at the International Food Policy Research Institute (IFPRI), Washington D.C. Before joining IFPRI in 1992 as a Research Fellow, Dr. Babu was a Research Economist at the Division of Nutritional Sciences, Cornell University, Ithaca, New York. Between 1989 and 1994 he spent 5 years in Malawi, Southern Africa on various capacities. He was Senior Food Policy Advisor to the Malawi Ministry of Agriculture on developing a national level Food and Nutrition Information System; an Evaluation Economist for the UNICEF-Malawi working on designing food and nutrition intervention programs; Coordinator of UNICEF/IFPRI food security program in Malawi; and a Senior Lecturer at the Bunda College of Agriculture, Lilongwe University of Agriculture and Natural Resources (LUANR). He has been coordinator of IFPRI’s South Asia Initiative and Central Asia Program. His past research covers a range of developmental issues including nutrition economics and policy, economics of soil fertility, famine prevention, market integration, migration, pesticide pollution, groundwater depletion, and gender bias in development. He has published more than 18 books and monographs and 80 peer reviewed journal papers. He has been on the advisory board of World Agricultural Forum and a Coordinating Lead Author of Millennium Ecosystem Assessment. He currently conducts research on Capacity Development including Economic Analysis of Extension and Advisory Services; Reforming of National agricultural Research Systems; Understanding Policy Process; and Institutional Innovations for Agricultural Transformation. He is or has been a Visiting as Honorary Professor of Indira Gandhi National Open University, India, American University, Washington DC, University of Kwazulu-Natal, South Africa, and Zhejiang University, China. He currently serves or has served on the editorial boards of the following journals – Food Security, Food and Nutrition Bulletin, Agricultural Economics Research Review, African Journal of Agricultural and Resource Economics, African Journal of Management, and African Journal of Food, Nutrition, and Development. Dr. Babu was educated at Agricultural Universities in Tamil Nadu, India (B.S. Agriculture; M.S. Agriculture) and at Iowa State University, Ames, Iowa (M.S. Economics and PhD Economics). Shailendra Gajanan is a Professor in the Department of Economics, and is the Chair of the Department of Business Management and Education at the University of Pittsburgh, Bradford. He received his BA and MA in Economics from the Presidency College and the Loyola College, University of Madras, India. He received and MA (1985) from the University of Akron, Ohio and PhD (1991) in Economics from the University of Pittsburgh. He joined the faculty of the Social Sciences Division at the University of Pittsburgh in 1991. He served previously as the Chair of the Social Sciences Division. Dr. Gajanan has served as the Program Director for Economics and has taught lower and upper level theory and policy classes in economic theory, econometrics, game theory, as well as applied classes in global hunger and environmental economics. He has also taught courses in India and West Germany. He supervises and directs International Study Abroad Programs and is slated to coordinate the Pitt-in-Himalayas in the summer of 2016. He has also served as an external evaluator on several thesis committees from universities in India and Malaysia. Dr. Gajanan’s research focuses on applied microeconomics dealing with water depletion within the commons, capacity utilization in manufacturing, the premium in the labor market for skills with English, and the impact of Category Management on product assortment in retail. He is the co-author of Food Security, Poverty and Nutrition Policy Analysis: Statistical Methods and Applications (Elsevier 2014). Arne Hallam is a Professor in the Department of Economics, and Associate Dean, College of Liberal Arts and Sciences at Iowa State University. He received his B.S. in Agricultural Economics from Brigham Young University in 1977. He received M.S. (1980) and PhD (1983) degrees in agricultural and recourse economics from the University of California, Berkeley. He joined the faculty of the economics department at Iowa State University in 1983. He served as chair of the Department of Economics from 2000-2009. He served previously as Director of Undergraduate Programs and Director of Graduate Studies. He has been Associate Dean in the College of Liberal Arts and Sciences since 2009. Dr. Hallam has served as major professor for 26 graduate students and as a committee for more than 100 additional students. He has taught 24 different courses since leaving graduate school, 15 at the graduate level, including courses in economic theory, mathematical economics, statistics, and operations research, as well as field courses in agricultural economics, industrial organization, and environmental economics. At the undergraduate level he has taught a wide range of courses including economic principles, industrial organization, mathematical economics, agricultural ethics, economic development and sustainability. He has also taught courses in Egypt, India and Jordan. Dr. Hallam's research primarily relates to the economics of agriculture, resources, the environment, and energy. He is particularly interested in problems related to risk, uncertainty, asymmetric information, and the development of incentive compatible policies to enhance social welfare. Most of his recent work has to do with biomass production and utilization, water policy, and sustainability. Dr. Hallam has been a Boy Scout Leader for over 25 years. He and his wife have four children and 9 grandchildren. "Nutrition Economics: Principles and Policy Applications is a timely book. ...The authors should be praised for the incredible effort to be exhaustive, and for their ability to translate potentially difficult technicalities into simplified examples, including references to Stata commands." --Asian Journal of Agriculture and Development.